“Some people brought to him a paralyzed man on a mat. Seeing their faith, Jesus said to the paralyzed man, ‘Be encouraged, my child! Your sins are forgiven'” (Matthew 9:2, NLT). An old movie called Love Story made this line somewhat famous: “Love means you never have to say you’re sorry.” After many years of marriage and two children, I believe that’s not true. Husbands and wives need to say they’re sorry when they hurt each other. It’s good for kids to apologize to their parents and siblings. 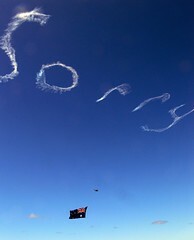 Saying you’re sorry makes relationships work a lot better. God likes hearing us say it too, but it’s not necessary to continually beg and plead for forgiveness. The paralytic in this verse didn’t even ask for it and Jesus forgave him, simply because of the faith of his friends. Before we ever asked for it, Jesus forgave us from the cross. It’s just not true that Jesus withholds his forgiveness—the first time we come to him or the thousandth time—unless or until we abhor ourselves in dust and ashes or perform bloody acts of contrition. As his beloved children, saying we’re sorry is more for our benefit than his. His love means we’re forgiven; our love back to him means saying we’re sorry (again) and thank you (again).